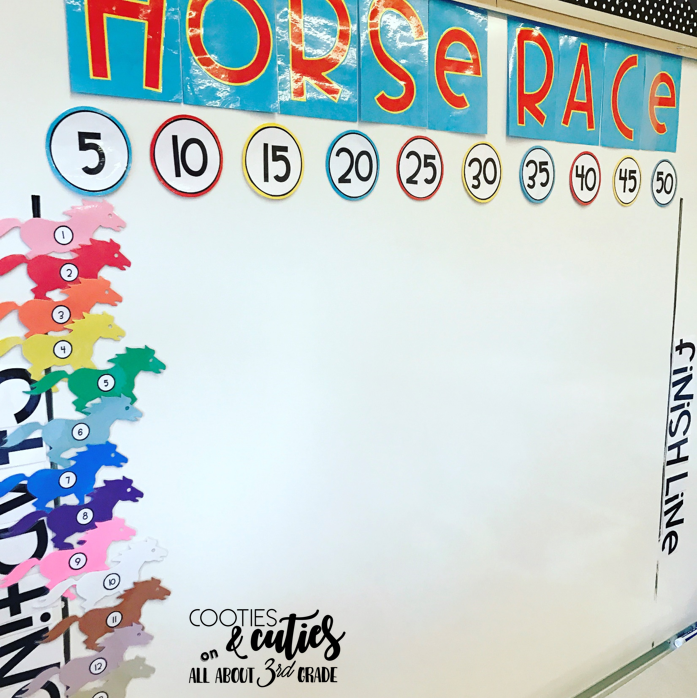 Hi, it’s Jessi from Cooties and Cuties, and I am so excited to share favorite test prep ideas with you! Test prep season is a dreaded time filled with stress and anxiety, and if I could avoid it altogether, I would. This year, I knew I wanted to do something different, something that actually got my students excited about the insanely boring work we were about to do. If I’m being completely honest, I created this experience as much for myself as for my students. 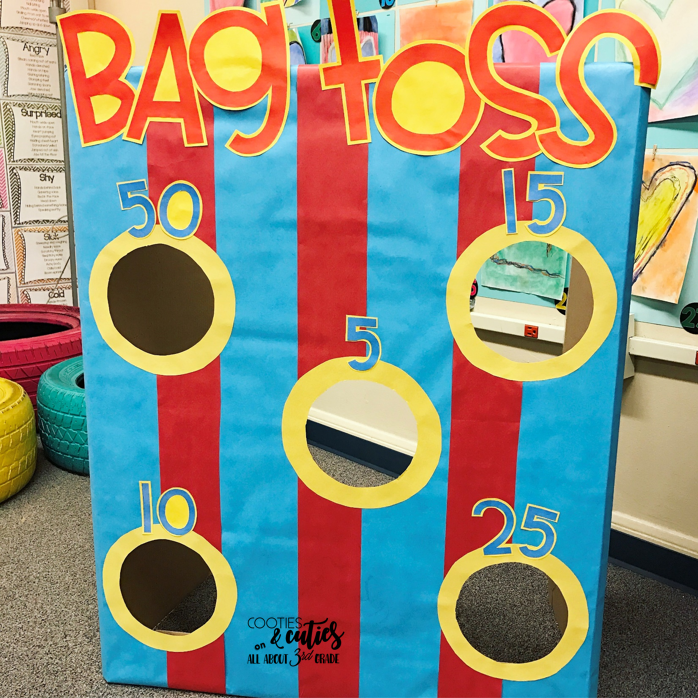 Test prep is never anyone’s idea of fun, but with a little effort, it can become one of your students’ favorite memories of third grade! A few weeks before the carnival, I started creating games during my planning period. Almost everything I created was free and made with resources I found within the school – butcher paper, cardboard and tape. The only things I purchased were 2 rolls of wrapping paper from the dollar store (so I could use the cardboard roll inside), streamers, a few bags of Hershey Kisses for the Kissing Booth and a roll of tickets. 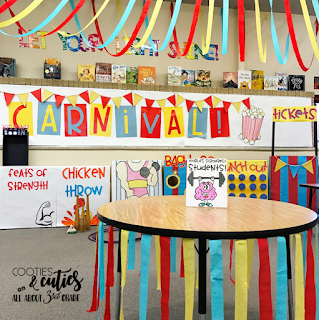 My kids had no idea I was planning a huge room transformation until I handed out carnival invitations on Friday afternoon. 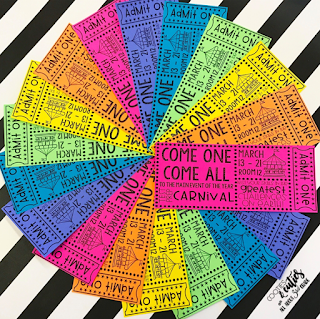 These little invitations built so much for the upcoming week and many parents emailed me to tell me how excited their kids were to come to school on Monday – teacher win! The carnival ran for 8 days. Each day, we reviewed a different math topic in a mini lesson, i.e., multiplication and division one day, area and perimeter the next. Some days we reviewed only one topic, and some days we combined two topics. I tried to organize the reviews based on the amount of questions we anticipated on the state test. After reviewing the topic, students worked in teams on the matching review packet. The questions were TOUGH. Instead of stressing my students out before the test, I paired them with a partner and emphasized teamwork and synergy. 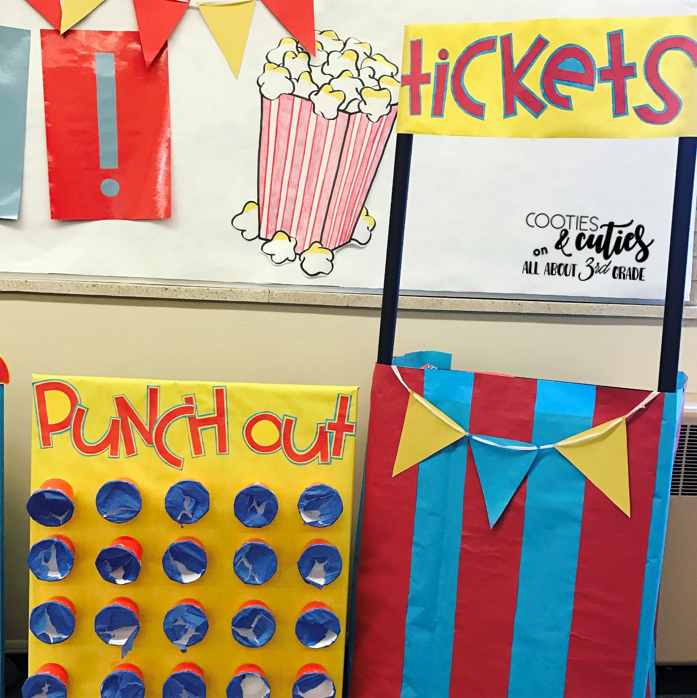 Partners could earn a total of 5 tickets each day for accuracy, perseverance, synergy, showing work and using their test-taking strategies. I assumed each team would earn 5 tickets and then deducted tickets as needed. While students worked, I roamed the room doing mini conferences with students to re-teach tricky concepts. This was such a valuable time to be able to meet the needs of all students, and I highly recommend it! The carnival was centered around math test prep, but I incorporated literacy, too. 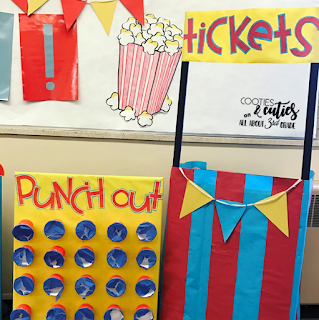 I printed PARCC practice tests, and gave students opportunities to earn extra tickets for the carnival. I am not kidding when I say I’ve never seen such a focused, engaged week of test prep in my life. Some of my students even begged to take their packets to recess or finish them at home! I kept track of the amount of tickets teams earned using the old horse race carnival game. Each team was assigned a horse and they loved watching their progress as their horses inched forward each day. The finish line represented a perfect score for the entire carnival run, 5 tickets each day. Only one team actually made it to the finish line, and it was a HUGE accomplishment. This team was on their A game the entire time and earned a special “catered” lunch with me in the classroom. At the end of the math period, we shared strategies and cleared up any remaining questions about the topic, and then I chose two teams to sit at the World’s Strongest Students (VIP) table. The WSS table was a last-minute idea and one of the most valuable pieces of the carnival. 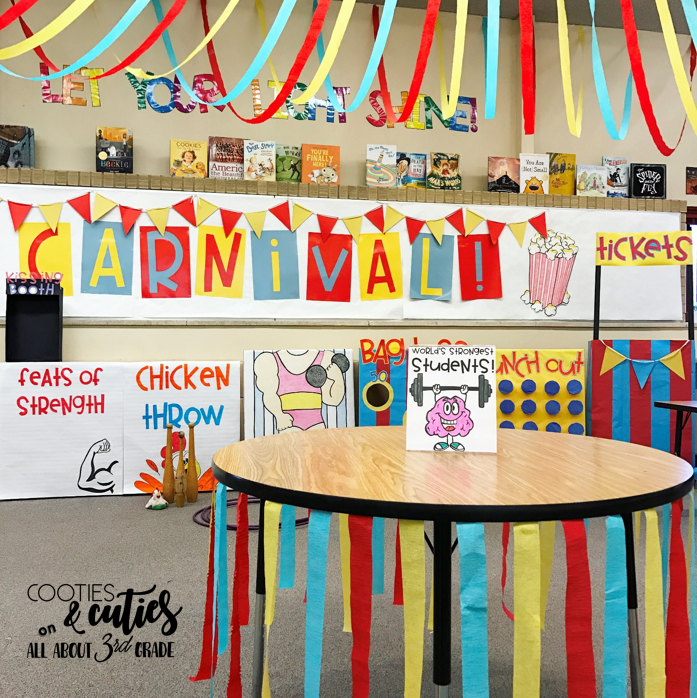 Students got to sit in a special table under the “carnival tent” in the middle of the room. I made the announcement a huge production, and the kids reacted like they won the lottery when their names were announced! One of the privileges of being the World’s Strongest Students was running the ticket booth. I love giving my students opportunities to lead, and they took this job very seriously. The carnival games were only open for the last 30 minutes of every other day, so 4 days total. This doesn’t seem like much, but it gave students an opportunity to earn more tickets between carnival visits and pushed them to work so incredibly hard in between carnival days. 2 hours of carnival games over the course of 8 days garnered 12 hours of the most intensely focused test prep I’ve ever seen and made all of the time I spent preparing so completely worth it. And finally, the last piece of the test prep carnival puzzle is Feats of strength. 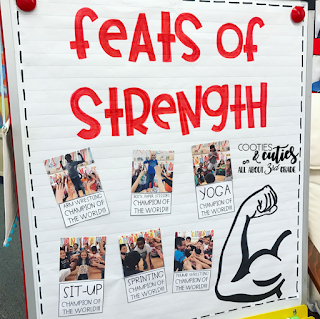 Feats of strength are mini contests, kind of like Minute to Win It, and we used them as brain breaks. Once or twice per day, I announced the contest and the whole class participated. It could be a feat of mental strength (how long can you hold tree pose) or physical strength (arm wrestling contest), and it became one of the highlights of the carnival. 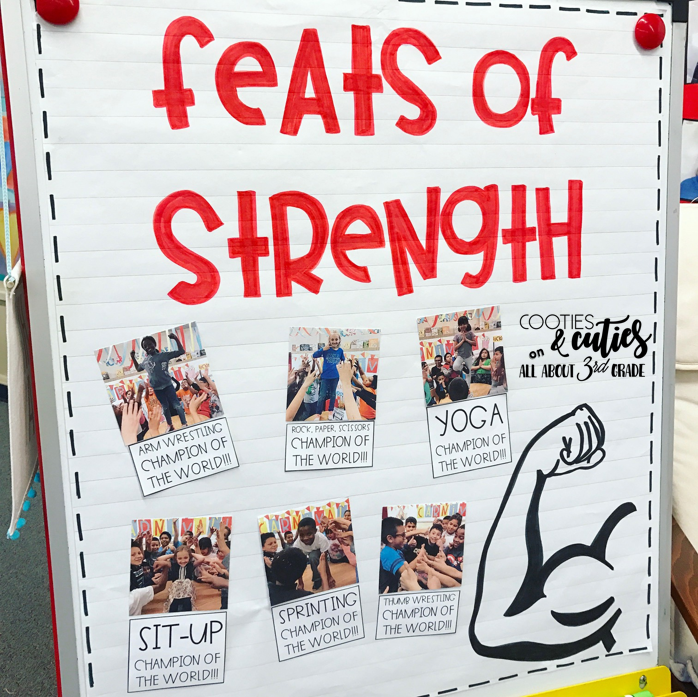 Students begged for the next feat of strength and took them so seriously because they wanted their picture to be featured on our poster. If they were eliminated, they became cheerleaders for the remaining students, and it was a really fun way to bond the students together as a whole. WHEW…that’s it. After 8 days of carnival-ing, my students were pumped up and ready to conquer the big bad state test. And, best of all, they didn’t even realize that I tricked them into completing some of the toughest packets they’d ever seen because they were having so much fun! Thanks so much for letting me crash the blog today! 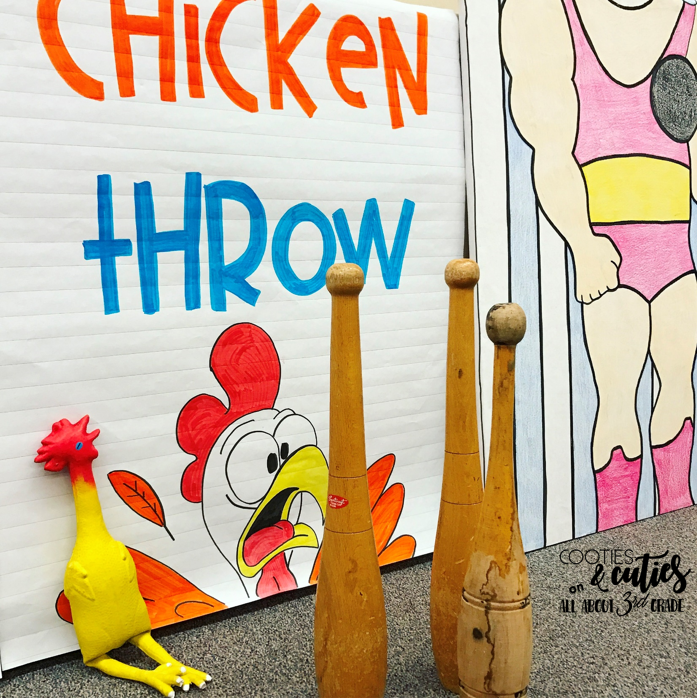 You can find my Carnival Test Prep and much more on my TPT page. What did you use for reading? I want to purchase your resource; but, need to figure out how to make this work for ELA. Thank you! I'm not sure I can ever go back to any other place, after an experience like this. This event venue Atlanta is appropriate in a space that lends so much gravitas to events. The design is sharp and environment is unbelievably good. What did you use for the horse cut outs on the horse race?